The feeling you get from jogging outdoors is so different from being cooped up in the gym. There are more things (and people of course) to watch but it is also the sense of freedom I truly enjoy. I am always extra cautious when running along roads though as I wear my iPod and that means I am not fully aware of my surroundings…it may just be cyclists whizzing past; another jogger trying to overtake or careless motorists. So be very careful when running on busy roads. Running on the treadmill can get really boring and monotonous. Stationary biking seemed to go nowhere. Outdoor biking lets you cover more ground and there is a certain sense of satisfaction upon arriving at your destination. But I have to admit, I am not much of a biker – trouble with balancing on anything fewer than a 3-wheeler. However, the gym does offer great advantages especially when time is tight and weather unpredictable. 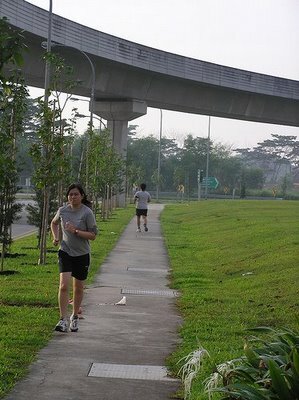 It is a safe alternative when you cannot find an outdoor area that is safe for running. For eg. heavy traffic and lack of space and dangerous spots. Besides, the gym is air-conditioned, so it means you can work harder and longer without the exhaustion that sets in easier in our humid climate. 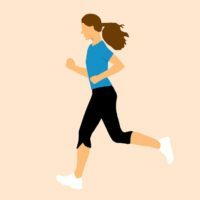 There is a clear and concise way of measuring the distance or rounds you have completed, and it makes a good benchmark to push yourself more the next time. The machines and free weights gives the body another type of workout besides cardio or aerobics. Resistance training helps build muscles and tone the body. It can get boring (both for you and your body) if the same types of resistance exercises are done. So I read many fitness magazines to get new inspirations and ideas to spice up my exercise routine so that I am never too jaded! But I must say, on days that me or my body is unwilling to work hard, then taking it easy on the cross trainer, stationary bike or treadmill is a great option. Besides, I get to watch some news programs (too bad they don’t have cable programs in my gym). Sometimes, I even read while working out. Hmmm… efficient and productive indeed.